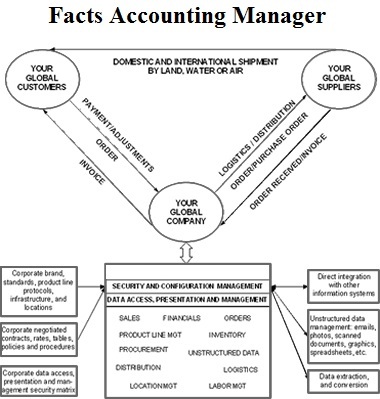 Companies that design, engineer, manufacture and/or market their finished products using a highly dynamic supply chain and then ship (or drop ship) their finished product to a warehouse, distribution center, or a point of sale to another domestic or global location, are ideal candidates for our Facts Accounting Manager software solution. Getting the advantage in the marketplace is no longer and option but an imperative. Those companies that can capture the cost advantage, the first to market advantage and the product capabilities advantage will succeed in the most challenging markets. This requires that a company really know its costs, including hidden global logistics costs, the cost of keeping inventory, and the cost of the manufacturing the product, all of which can heavily impact profitability. A company will need to know very quickly after a product comes to the marketplace whether it's selling, whether the price is competitive, who's buying the product, where it's being bought and when. Sustained effort in all these areas will be important for the long term strategy of a global company and having timely, accurate information about how your company is performing in the marketplace will mean the difference between success and failure. Biundo & Associates Facts Accounting solution can give you the competitive advantage you need to succeed by tracking the critical business dynamics of your business.